Dream Daddy #4 Review – AiPT! It’s dad vs. dad in a science fair smackdown the likes of which the Maple Bay library has never seen! In Dream Daddy #4, Brian and Joseph get caught up in a DAD-off over their children’s science fair. 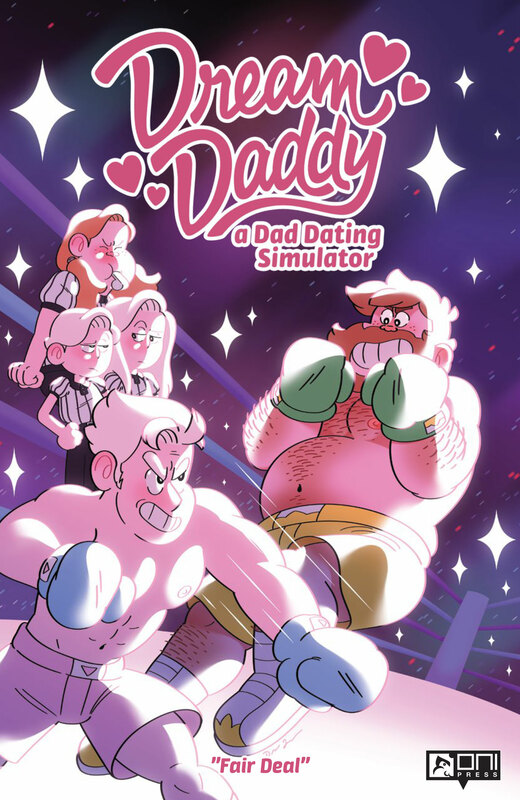 There’re only two issues left of Oni Press’s DADtastic aDADtation of the Dream Daddy dating sim. Does this penultimate issue keep the good dream rolling? Writer C. Spike Trotman scripts a super lighthearted romp in the world of Dream Daddy that excellently captures the tone of the game while maintaining the sincere emotional center. Joseph and Brian’s conflict is over the top in a way that feels very true to the comedy and serves the comedy well, but Trotman also keeps the pressure their tussle puts on the kids at the forefront. This lets the humor shine while also telling a very relatable story for people who’ve felt the pressure of being a straight-A student who constantly had to set the bar even higher. I especially love how Trotman handles the voice of Daisy and they way she processes the idea of breaking rules. It was very relatable for me personally, but all the feelings present in the issue are conveyed well enough that readers should be able to sympathize with the characters even if they haven’t felt the same thing themselves. As always, the real test of adapting Dream Daddy comes down to how the game’s secret-not-secret real star Amanda is handled, and Trotman passes with flying colors. She isn’t in the issue a ton, but when she appears, she sounds just like she does in the game and grounds the issue as the voice of reason. Artist Drew Green’s pencils and inks for the issue match the tone of the script perfectly with their bubbly, joyous feel. Aside from structures like buildings and bookshelves which necessitate sharp angles, everything in the issue feels very round and soft which invites the reader in to get comfy. In terms of detail, Green’s style in this issue is very sparse, but he doesn’t need a lot of lines to express an idea or emotion. By just adding a couple lines around a character’s widened eyes, he conveys panic clearly without muddying up the face with unnecessary detail. I particularly like the way he renders Joseph’s twins to be prim and put together at one moment and creepy in a cartoonish way the next, mostly through a more generous use of ink on their faces. Reed Black’s coloring work is done with a similar approach to Green’s lines in that it is kept very simple, but without the feeling of there being something missing. There are a lot of purples and pinks throughout the comics that give the book a warm feeling that matches the tone well. Even with a flat coloring style, that isn’t to say there’s no regard for shadows and Black accounts for the way characters’ hair folds or where a shadow falls. Hassan Otsmane-Elhaou continues to letter the series and this issue in particular contains a lot of banter with word balloons all over the panels. Though there are a lot of balloons on the page, Otsmane-Elhaou guides the reader’s eye through them well and organizes them in a way that utilizes the space well. Overall, Dream Daddy #4 is another great issue in a series that continues to flesh out and elevate the dating sim on which it’s based. I feel like I say this in every review for this series, but if you are a fan of the game or of the series thus far looking for a cute, fun, heartfelt read, pick up this issue! I’m so sad there’s only one more issue left in this excellent anthology. The whole team brought a sincere, funny, warm touch to each aspect of this issue from the script to the art to the lettering. Trotman’s script is fully of humor and heart and really captures the voices of the characters well. Green’s line art is soft and inviting, conveying plenty of emotion with very few lines. Black’s coloring fits the tone well with a palette that feels warm. Otsmane-Elhaou’s lettering continues to impress with excellent balloon placement for a wordy script.